Hitting out of a bad lie can save a hole and improve scores. There is nothing more frustrating than to hit an excellent tee shot, only to have your ball land on a difficult lie. A bad lie requires a different approach in order to get the ball back on track. Here are a few guidelines that you can follow to rescue your shot out of a bad lie. Attack the ball using a steeper angle on your club. This swing produces the right kind of ball striking where you hit the ball first, then the turf, which in turn produces backspin and control. Hinge your wrists more in your back swing than you would if your ball landed on a good lie and place your hands ahead of the ball at impact. 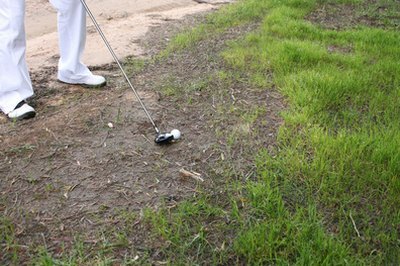 Hold your club firmly to get the ball out of the rough and to prevent your club from twisting in your hands at impact. Place 60 percent of your weight on your front foot to encourage a steeper angle of attack. Maintain a good tempo in your back swing and follow-through.